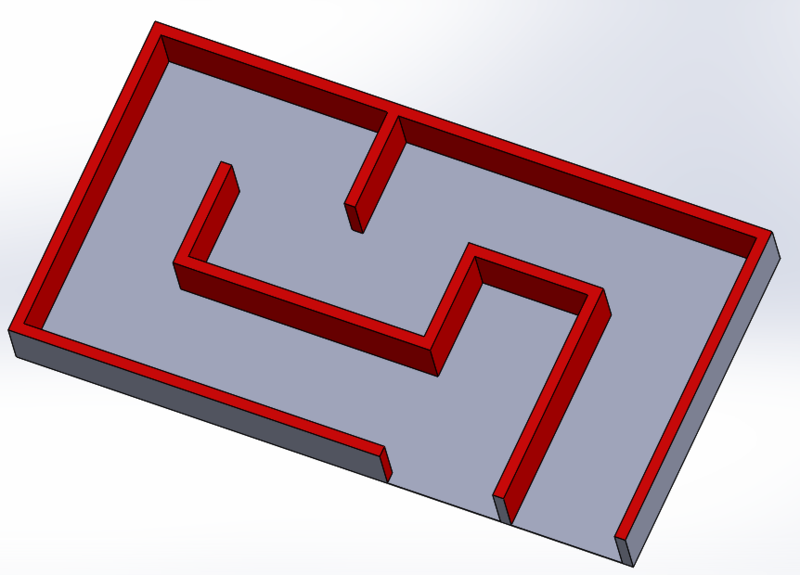 The actual course being revealed is a little of a surprise, as the challenge description initially said the design would be a surprise, encouraging either a generic approach (like wall following) or a ‘maze solving’ strategy. Now the actual course is known, a more specific and optimised solution will probably be faster and more reliable. Last year we looked at different approaches to the course, to see which might give the fastest or safest route. This year we’re expecting to have a better handle on where we are on the course (using the encoders and IMU, as well as distance sensors), so that may open up some faster and more sophisticated lines. We thought it was worthwhile to sketch the options out and see how the theoretical times compare, to see how worthwhile it might be to do the development. 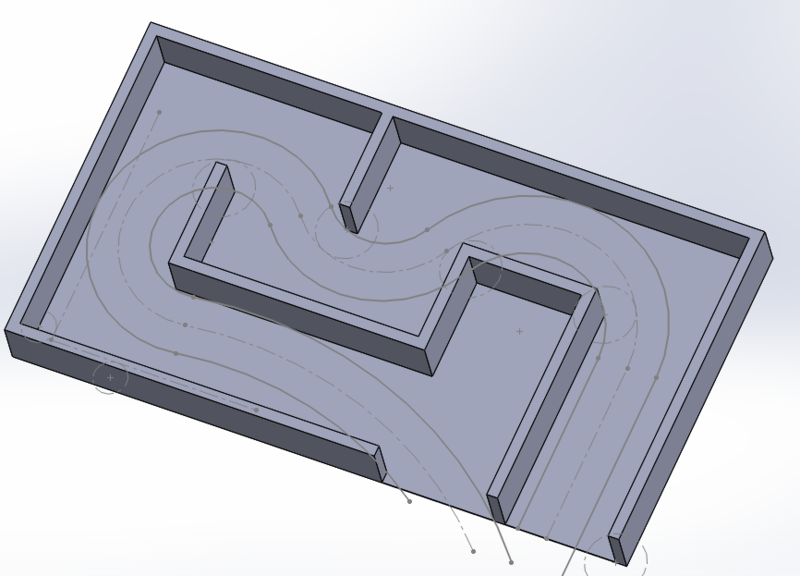 Previously this approach has been fairly accurate at predicting times in the straightline speed challenge, so we’re fairly confident in using it to estimate performance for the maze. Using this model, we can combine the acceleration profile and the distance of each straight line segment of the approach above and estimate the transit times. Adding on a time to turn 90 degrees at each corner (we’re assuming 0.1 seconds, as that’s about what Piradigm needed to turn 90) gives a predicted total time of 5.3 seconds to complete the maze. If you’d attended previous Pi wars, you may think this was a ridiculous prediction, as most competitors took 20-30 seconds. This was mainly because they take a very tentative approach to the maze. Last year in practice Piradigm could fairly repeatably achieve 10second times whilst not running “full throttle”: (https://youtu.be/EV7YIHr5feg?t=541) and we did achieve one ~6 second time, so its certainly possible. Last year we found this to be much faster and no more risky. Predicted time: 4.3 seconds, a handy saving. 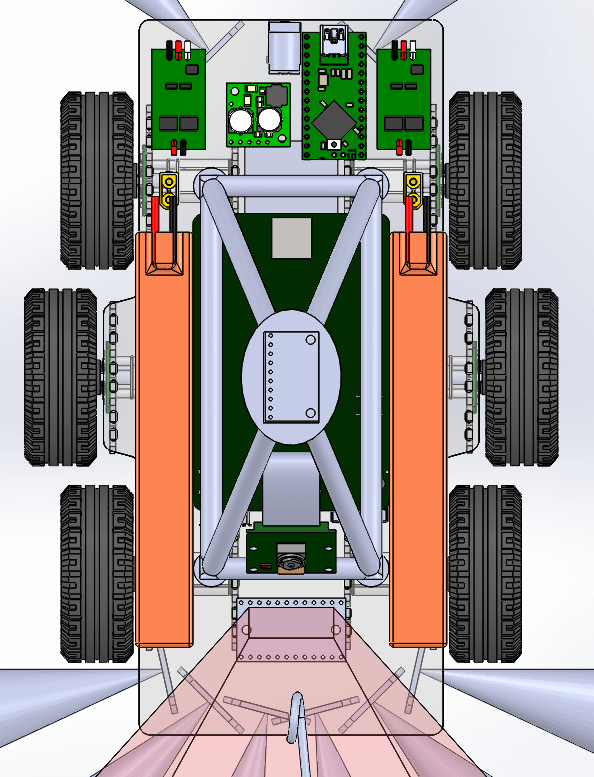 This is assuming each corner is taken at 1.6m/s, which is at approximately the limit of traction of the tyres. 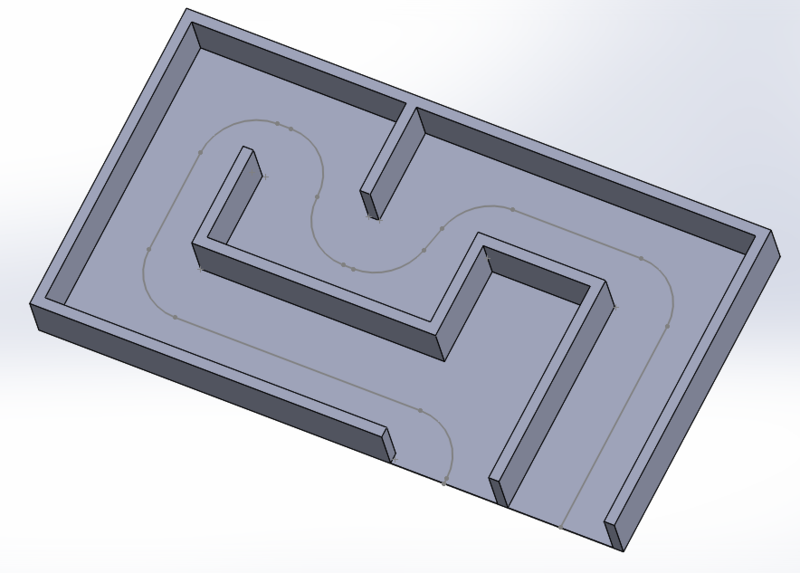 Hopefully the IMU will allow us to stably and repeatably skid a little in the corners, otherwise we’d have to go a little slower to retain control. With the larger radius turns, we think they could be taken at more like 2.3m/s, and the distance travelled is a fair bit shorter than the second course, so the predicted time plummets to 3.2 seconds! That is a nice target number but in reality we wouldn’t plan a route taking us so close to the sides, we’re unlikely to be perfectly positioned and hitting a wall can disorientate the robot and end the run. How much longer would it take if we take a racing line with a safety margin? say 75mm clearance? The ‘safer’ racing line is ~0.3m longer and the slightly tighter corners mean going a little slower at 2m/s, but the predicted time is still only 3.6 seconds. That’s all great, but the above predictions were assuming no downforce. As we discussed in our week 3 update, we’re intending to fit a vortex downforce generator. So how much faster can we go with that? For the ‘safer’ racing line we’re predicting a 3.1 second time, and the faster, riskier line a bonkers 2.6 seconds. Some crazy numbers, lets hope the software and electronics can give us the control needed to get the hardware to deliver the times its capable of. Not much progress to show again this week. 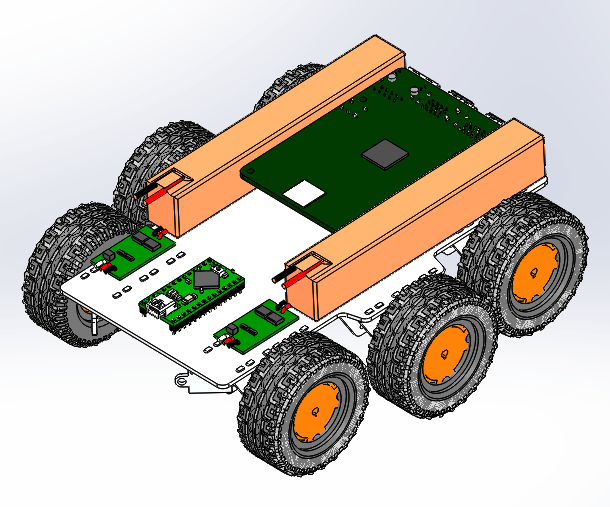 We’ve again been researching and trying to get our heads around Kalman filters, and have been learning a new software package to design our chassis/pcb. In every one of our previous Pi Wars entries, we’ve had issues with loose wires causing erratic behaviour at some point. We’ve often wondered if having a pcb made to eliminate much of the wiring would be easier and more reliable. 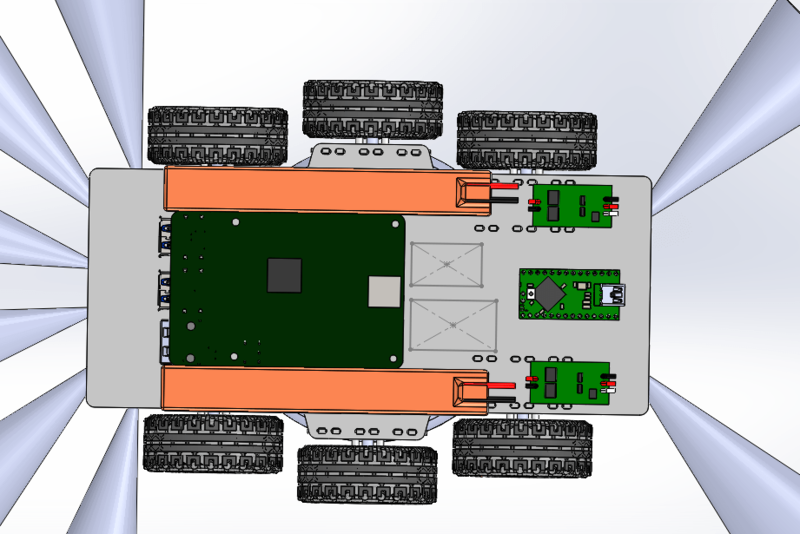 So this year we’re going to try to have as few cables and connectors as possible and mount most components directly to a pcb. In other news, the cheap encoders have arrived, but we’ve not had chance to test them yet. Formula one cars corner much faster than normal cars due to their aerodynamics: as they move along, they use wings to deflect the air upwards, pushing them into the ground, increasing grip without increasing weight. This works great if you have the power and speed to do that. unfortunately most Pi Wars challenges are completed at less than 5mph, so the wings would need to be huge to have any effect. This design was a little different to the above mechanisms, it used a vortex suction generator, which is a vaned, high speed spinning bowl that spins the air rather than sucking it, to generate the required low pressure with lower power consumption and less reliance on a good seal with the ground. The theory is that because the air is spinning, there must be a pressure gradient to keep the air going in a circle. Since the outside of the bowl is at atmospheric pressure, the centre must be at a much lower pressure, sucking the bowl down. In this test, we held the rotor above a metal toolbox, that was supported by some scales. We were hoping to both test if the rotor could survive the very high speeds required and, if it did, what level of downforce we could generate (measured by the lift or reduction in weight of the toolbox). For the test we were stood well back, with a full face shield on in case the worst happened. From the test video, you can see it was a successful test: the rotor survived spinning up to ~14000rpm and generated over 900grams of downforce, despite having over 5mm of ground clearance! 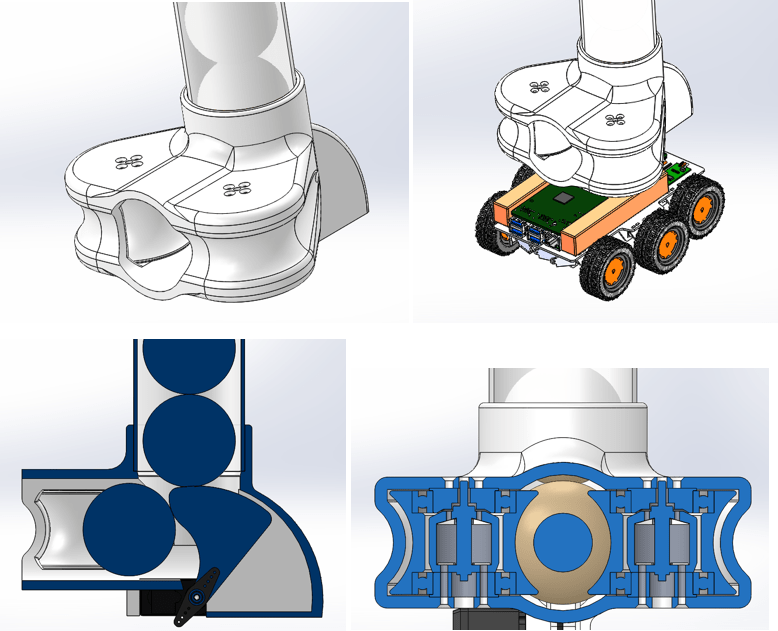 For comparison, from the latest CAD model we have of the overall robot design, we’re expecting the all up weight to be about 800grams. Which means we should be able to corner at up to 2g, if we have sufficient control. 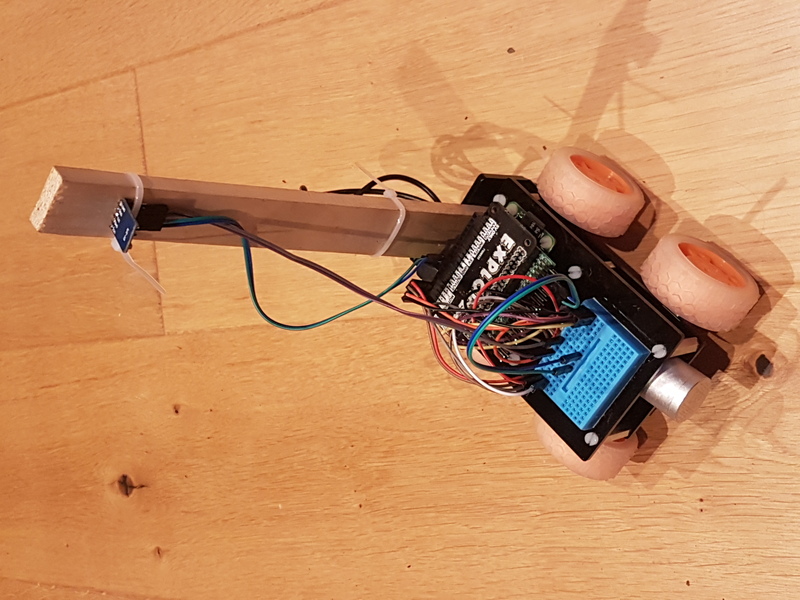 It’s been a productive week for the Tauradigm team, we’ve tested a prototype projectile launcher, researched sensors for odometry, mapped out the system architecture, evaluated a magnetometer board and order some of the key components. The result is just about ok. It could do with the balls having a bit more energy, so they fly rather than bounce towards the targets. 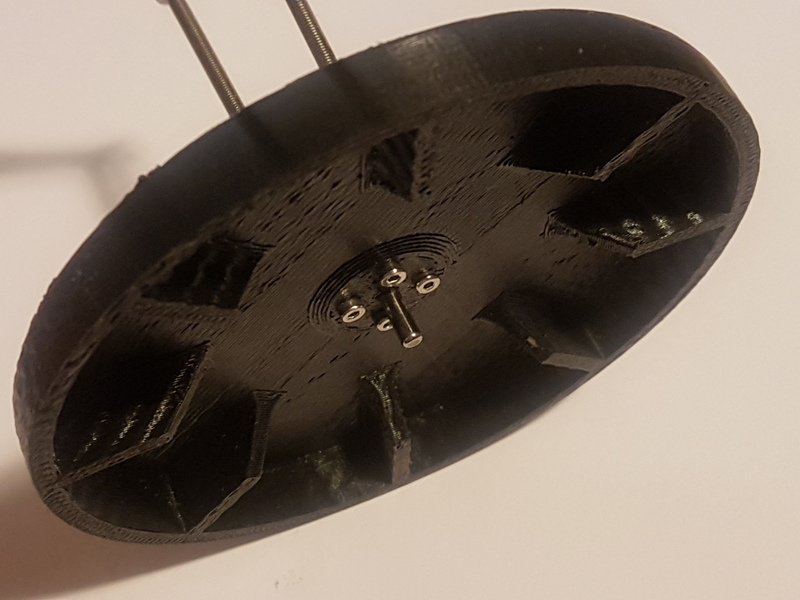 I’m not sure if its because the flywheel tyres are soft, as well as the balls, so they’e not getting much grip, or because the flywheels are too far apart, or because there’s not enough energy stored in the flywheels. Still, a promising result and worth further development, since the balls knocked over the books and there’s no way the elastic bands from last year would have managed that. Odometry is the fancy word for sensors that tell you how far you’ve traveled. 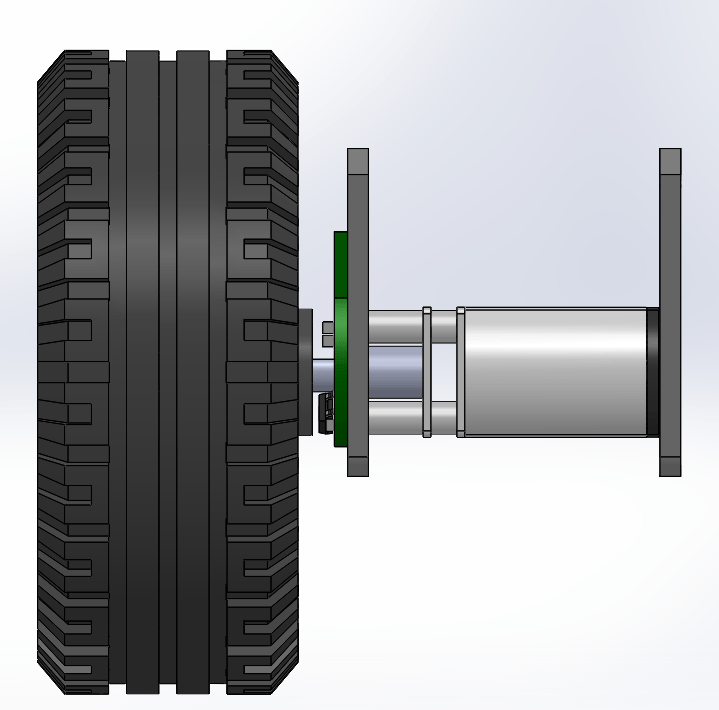 The classic example is wheel (or shaft) encoders where markers on the wheels or motors are counted, to allow the travel distance to be estimated (its an estimate as the wheels may slip). There are now also optical flow based sensors, where a series of images are taken, key reference points identified in each frame, and the travel distance worked out from there. This can eliminate the wheel slip error, but introduces other potential errors such as when when the camera to ground distance varies, the perceived speed changes. 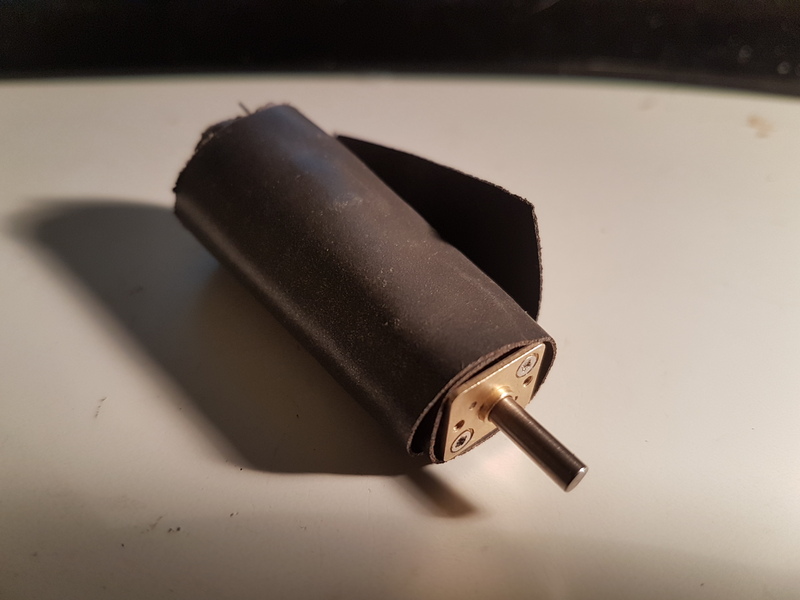 As mentioned previously, we ideally want an encoder that doesn’t interfere with our magentometer (no long range magnetic fields), is fast (better than 100Hz), precise (better than 1mm resolution when used on a 50mm wheel, so more than 100counts per rev) and isn’t sensitive to dirt, contamination and sunlight. 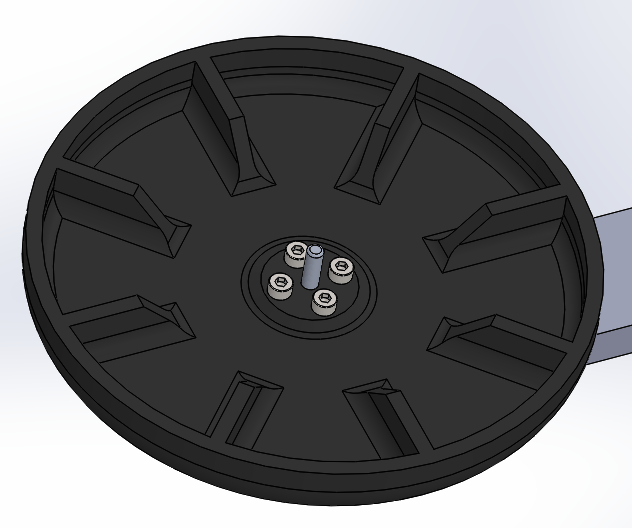 The slotted wheels can have very fine spokes, so potentially hundreds of counts per rev. No magnets, very fast (khz), precise, but may need covers to protect them from sunlight and dirt. 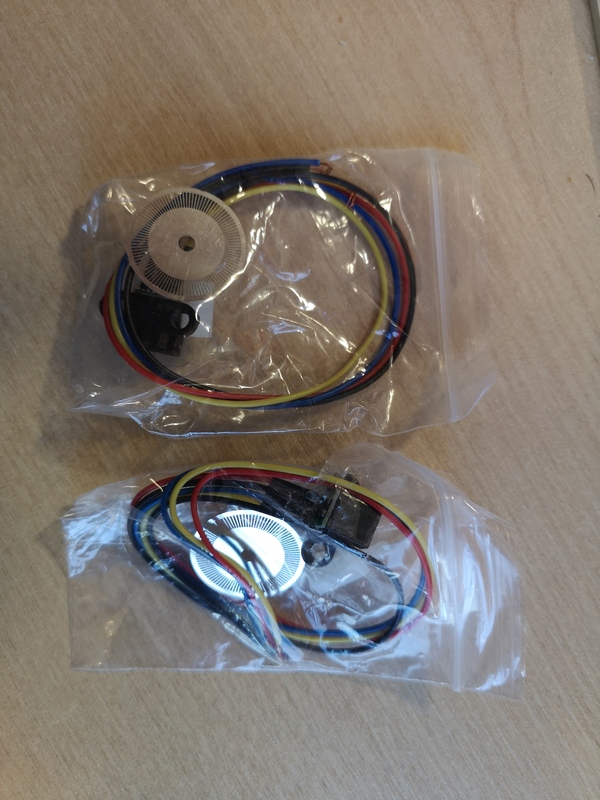 There are some very cheap ones on ebay at the moment: https://www.ebay.co.uk/itm/Photoelectric-Speed-Sensor-Encoder-Coded-Disc-code-wheel-for-Freescale-car/253111107514 that look promising, so we’re getting a pair for testing. 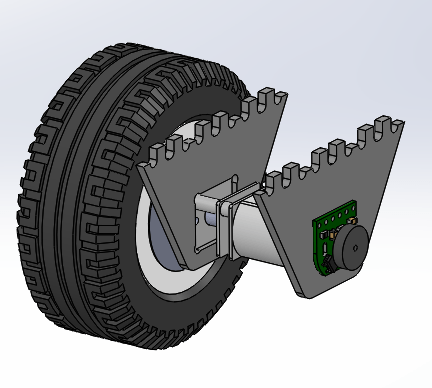 the sensor is a little large and may make our wheels stick out a little too far, but there’s no actual datasheet available, so we’ll have to see when they turn up. 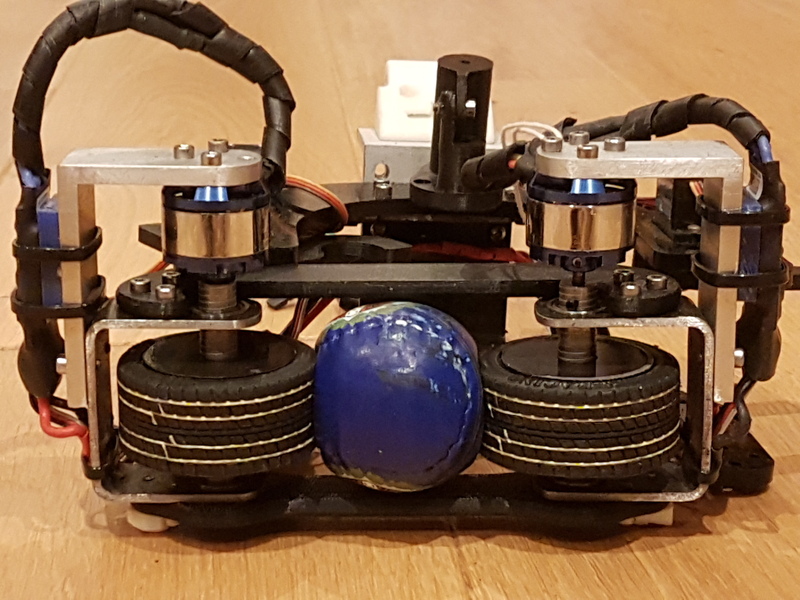 the ‘miniQ’ encoder is fairly cheap: https://www.robotshop.com/uk/miniq-robot-chassis-encoder.html and appears to be much like the discontinued Pololu wheel coder: https://www.pololu.com/product/1217 that only had 48 counts per wheel rev. all magnetic sensors might interfere with the magnetometer. those with weaker and shorter pole length magnets may be better, but they will also be more sensitive to alignment. the magnetic sensors should be most tolerant of dirt and sunlight. 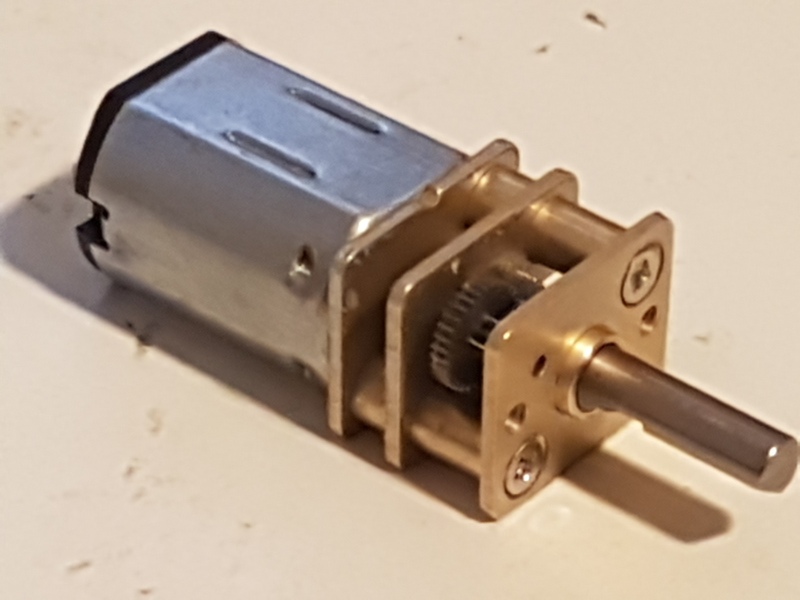 we could potentially mount these 20 counts per rev encoders https://www.robotshop.com/uk/magnetic-encoder-pair-kit-20d-mm-metalgearmotors-20-cpr-27-18v.html to our output shafts, but that wouldn’t give enough resolution. higher pole count magnets may be available, but they would be very sensitive to alignment since the poles would be less than a millimeter apart, and they seem to be expensive (>£30 each). 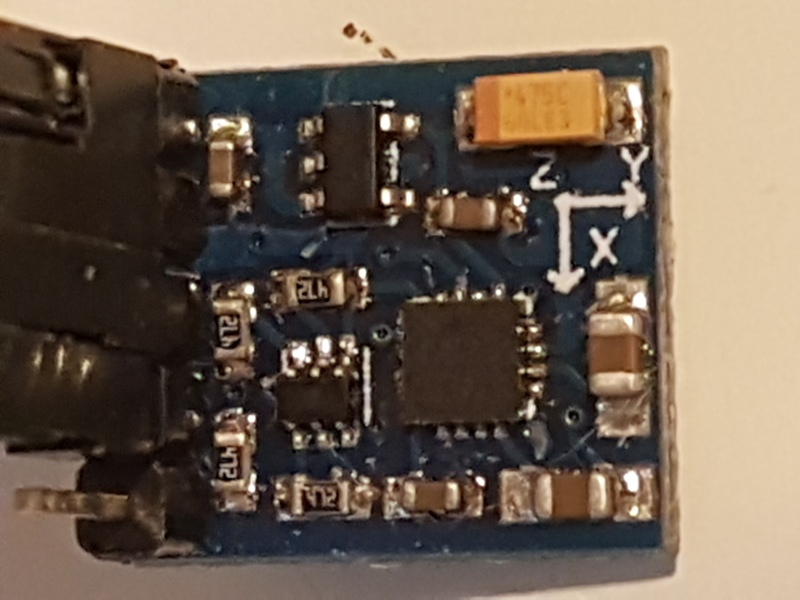 the chips seem to be rare but evaluation boards are available. cheap, fast, precise, but need to be on axis (so on the outside of the wheel, and therefore sensitive to knocks): https://uk.farnell.com/broadcom-limited/aeat-6600-t16/encoder-magnetic-ic-16-bit-program/dp/2213639?MER=bn_level5_4NP_LastViewed_1. no breakout boards are available, so they also need us to make a pcb with surface mount soldering. optical flow solutions fit into two categories: general purpose cameras with specialist software analysis, and dedicated hardware based solutions, often based on optical mice. The mouse chips tend to be cheaper and faster. minimum focus 0.4m may be able to replace the lens. £7, 1500 – 6400 fps! minimum focus unknown but lens can be changed. cheap enough to try. The chip is also available without a replaceable lens, but the focus distance is then only a few millimeters and so too close to the ground to be practical for us. so lots of options available, none ideal. We’re going to start with the cheapest and see what we learn. For most challenges, we’re aiming to use map based navigation, and rely on ‘external’ sensors as little as possible (after the issues with light interference last year). To do this we’re planning to have a microcontroller very rapidly reading simple sensors like the IMU (including the magnetometer) and encoders to keeps track of where it thinks it has traveled and adjust the motors accordingly, aiming for a given waypoint, whilst keeping the pi up to date with what its doing and where it thinks it is. 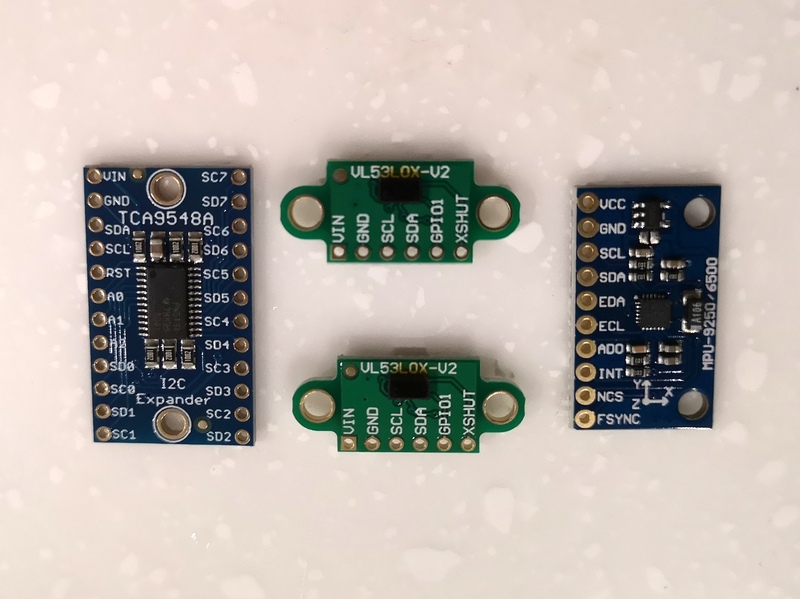 The Pi will keep track of the location on a representative map, use key features to update the perceived location on the map and give the microcontroller new waypoints to head for. Localisation (figuring out where we are on the map) and route planning will be separate modules. See this page: https://atsushisakai.github.io/PythonRobotics/ for a collection of algorithms written in python that achieve this, along with animations representing each one’s approach. Our Pi will use ToF sensors and image processing to detect obstacles and use them as inputs for correcting the perceived location. 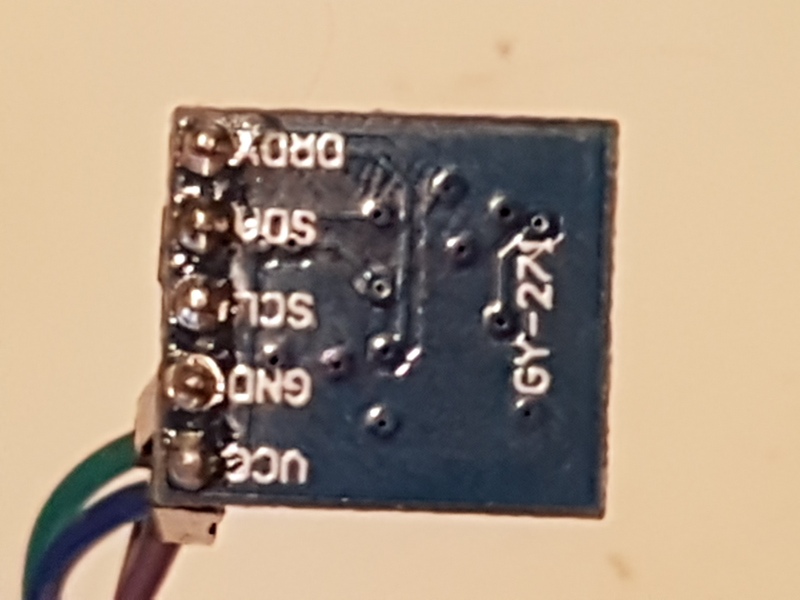 Since we already had a gy-271 magnetometer (HCM5883L breakout board), we thought it was worth doing a few tests to see if the magnetic field of the motors would interfere with the results. The HCM5883L is a 3axis magnetometer, so doesn’t know its orientation to gravity or its turn rate like an accelerometer or gyroscope does, but by measuring the local magnetic field the results can be used to calculate the current orientation. Interestingly, in most orientations this gave no improvement, and in some orientations it was worse than no shielding. We think the material may have been concentrating the motors magnetic field into a better magnetic shape or directing more towards the magnetometer, or maybe the earths field was also affected by the material. We couldn’t entirely engulf the motor as we need the power wires to exit one end and the gearbox output shaft to exit the other. If anyone can suggest a more suitable material or arrangement, please let us know in the comments. Good magnetic shielding materials seem to be very specialist and expensive, and will likely add more weight than a plastic sensor tower, so for now we’re going with that. 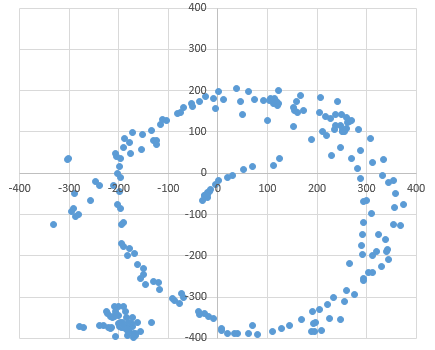 This is after some scaling and conversion, so the units are a little meaningless, but it shows the magnetic field strength in X and Y as the sensor was rotated. Since the earth’s field is constant, this should result in all the points being an equal distance from the origin, clearly this is offset to the right and downwards. The scaling looks ok as both axis vary by the same amount. After we changed the offsets we got much better results. So lots of progress. Hopefully next week we’ll evaluate a few more sensors and develop the Tiny test bed further. 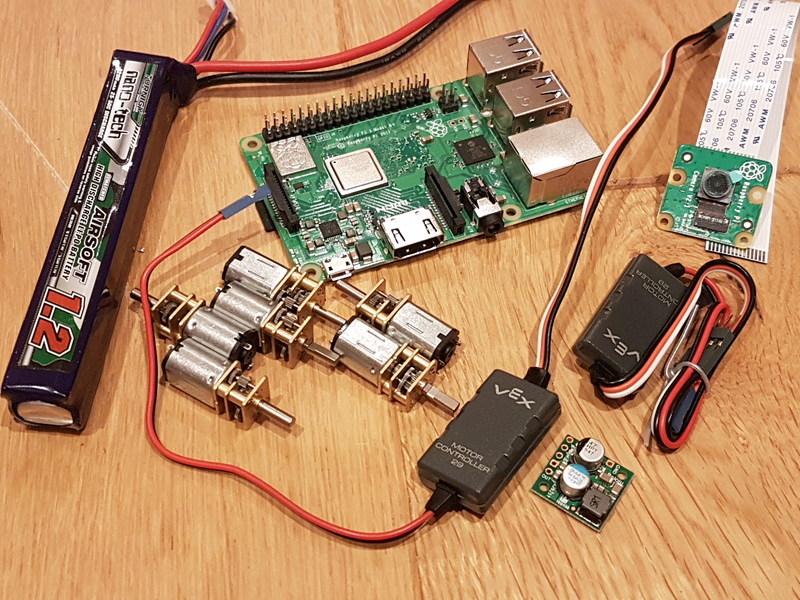 Its that time of year again, where Hitchin Hackspace get slowly obsessed with Pi powered robots, in the build up to Pi Wars. 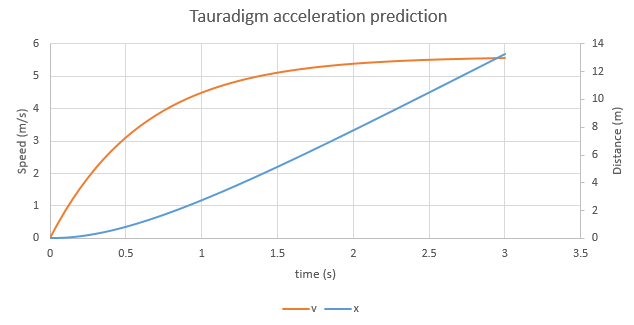 Hitchin have again applied with two entries, this is post will be focused on the entry for Tauradigm, another fully autonomous entry and successor to last years Piradigm entry. Team details: Mark Mellors: Professional Mechanical Engineer, lead on the mechanical and electrical side of the robot. Previously did majority of work (across all disciplines) on last year’s (disastrous/’ambitious’) Piradigm. Both Mark and Rob have also contributed to all of Hitchin Hackspaces Piwars entries, from main team members in ‘16 to occasional advisers in ‘18. Why do you want to enter Pi Wars? : Retribution! To show that full autonomous is possible! But also, as before, to inspire, share and stretch ourselves. The entry only went in last week (sorry Mike and Tim for leaving it late!) 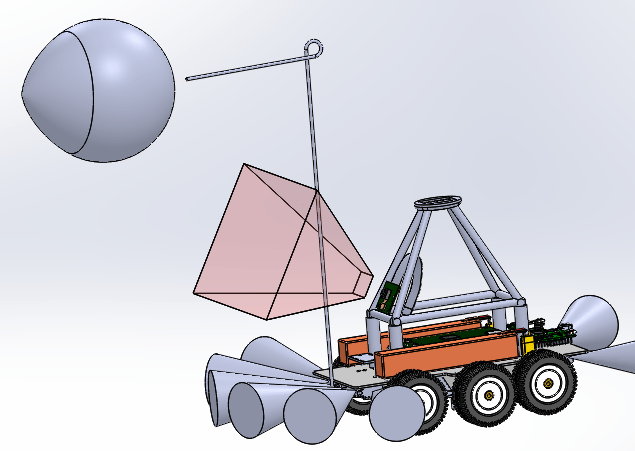 yet we’ve already realised we might need to make some changes to the robot design. Fingers crossed we get accepted!